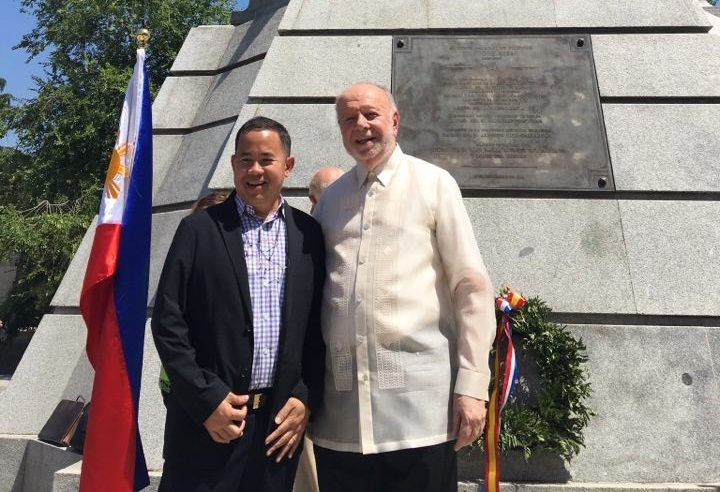 Ambassador Philippe J. Lhuillier and the Knights of Rizal Commander Federico Sanchez, led a wreath-laying ceremony to commemorate the 156th birth anniversary of Dr. Jose Rizal. 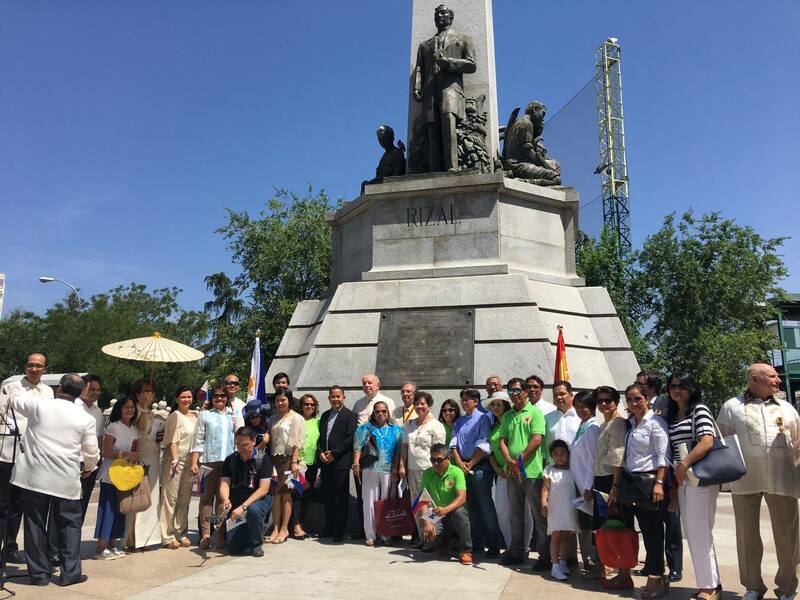 The event was held at Dr. Rizal’s monument in Avenida Islas Filipinas in Madrid. 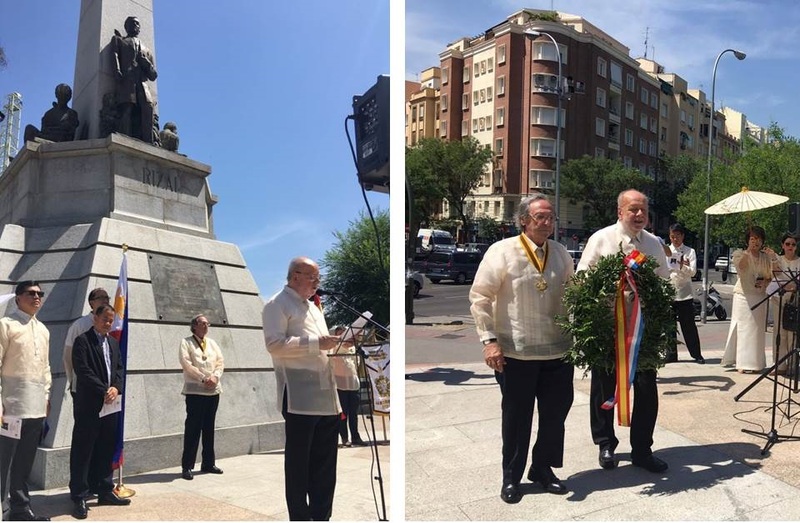 The ceremony saw the presence of Dr. Rene Escalante, Chair of the National Historical Commission of the Philippines, the officers and members of the Knights of Rizal-La Solidaridad Chapter, the members of the Filipino community and the personnel of the Philippine Embassy in Madrid. Ambassador Lhuillier, in his message, said, “This year’s theme for the 119th Anniversary of Philippine Independence, Pagbabagong Sama-samang Balikatin, is a fitting tribute to the sacrifices made by Dr. Rizal and all of our heroes, who were themselves agents of change. It reminds us of our heroes’ collective effort to bring about change and progress. It reminds us that change is, and cannot be, brought about by only one person”. He added, “Our celebration of Dr. Rizal’s birth anniversary this year is special, as we are also celebrating this year the 70th Anniversary of the Establishment of the Diplomatic Relations between the Philippines and Spain. If Dr. Rizal were alive today, I believe he would be celebrating with us, pleased with the thought that Philippines and Spain are on equal footing, and are enjoying long-standing friendly relations”. For his part, Mr. Sanchez, underscored Dr. Rizal’s immersion in and deep understanding of Spanish culture and applauded him for his achievements as, among others, a writer, a doctor and an artist. The event concluded with the reading of the poem “Mi Ultimo Adios”, which was written by Dr. Rizal on the eve of his execution by firing squad on 30 December 1896.